Cactus Flower on Good Morning AZ! Check out our own Tonia Miller on Good Morning AZ on December 10, 2008. 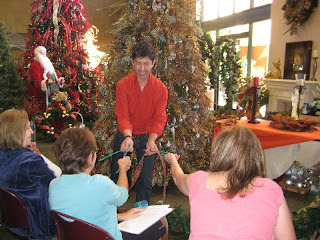 She demonstrated how to make a holiday centerpiece and talked about our final Tinsel Training class, held on 12/11. Click here to launch the segment. Do you have a great boss? Show your appreciation (and win some brownie points!) with a small floral gift from Cactus Flower. National Boss's Day is this Thursday, October 16, but you can celebrate any day this week and you'll be the office hero. For Phoenix area delivery, check out our exclusive arrangements created by Cactus Flower designers. If you're anywhere else in the country, click here for our nationwide selection of Boss's Day gifts. Customers Choose New Products for Website, While New Moms Enjoy Free Flowers! A special thanks goes out to over 400 of our customers who voted in our new baby survey! Thanks to your help, we now have 18 new products to offer on CactusFlower.com for welcoming new babies. The most popular arrangement was designed by Tonia Miller from our Bell Rd location. Tonia Miller serves as design manager, inspiring the team with cutting edge floral décor. Tonia’s early training and inspiration came from working with her father, a well-known floral design consultant. We have named her arrangement "Sweet Beginnings", and it is now available on CactusFlower.com for $50. After each of the arrangements were photographed for the survey, we delivered them to Scottsdale Healthcare Shea’s Family Birthing Center for the new moms to enjoy. To view the entire new baby collection, found exclusively at Cactus Flower Florists, click here. For more than 30 years, the United States has been celebrating National Rose Month each June. Roses have a long and colorful history. They have been symbols of love, beauty, war, and politics. Visit any Cactus Flower location and grab a dozen roses from the cooler for just $10! Colors may vary by store. 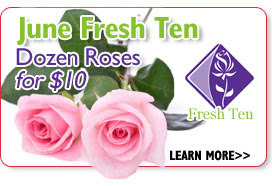 Fresh Ten pricing does not apply to arranged or delivered roses. Our Cactus Flower Deisgners have created three exclusive rose arrangements at unbelievable prices we can only offer once a year. Take advantage of the savings this month and send someone roses today, just because.....it's affordable! Celebrate the Most Special Women in our Lives...Moms! Mother's Day is only two weeks away. Whether you're celebrating your own mom, the mother of your children or any great mom in your life, Cactus Flower is your resource for beautiful Mother's Day flowers. For local moms, choose from a collection of exclusive Cactus Flower arrangements created by our award-winning designers. These can't be found anywhere else, and she'll know just how thoughtful you are when she sees the purple van pull up with a gorgeous arrangement just for her. 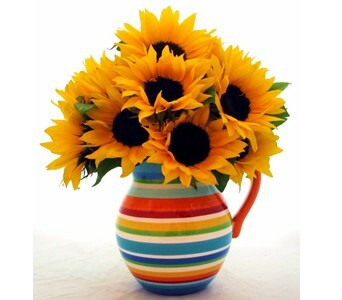 Our feature Mother's Day arrangement is Pour Some Sunshine, a colorful Crate & Barrel pitcher overflowering with 15 cheery sunflowers. If your mom is across the country and you'd like to let her know you're thinking of her on this special day, we can still take care of it! Cactus Flower works with thousands of florists to deliver Mother's Day flowers nationwide. Call, visit our store our order online for our entire selection of Mother's Day arrangements. Most importantly, don't let May 11 pass you by without telling that special mother in your life how much she means to you - whether it's with flowers, brunch, or a quick phone call. Cactus Flower is pleased to announce a NEW Happy Hour schedule: Noon-close in every Cactus Flower location! Now you can enjoy 50% OFF all loose cut flowers from our cooler (excluding Fresh Ten flowers) during your lunch hour, on your way home from work, or any time in between. Find a Cactus Flower location near you, and pop in next Friday for 50% OFF loose cut flowers from Noon-close. Closing hours vary by location, so please click here for store location details. Cactus Flower is pleased to announce a new program that will make the luxury of fresh flowers a little more affordable: Cactus Flower Fresh Ten. Every month, Cactus Flower stores will feature a wrapped bunch of a specific flower for $10. The flowers will change by month, but the $10 price stays the same. Just come in to any Cactus Flower location, grab a bunch and go. Our Fresh Ten feature for March is tulips. Originally from Persia and Turkey, tulips were brought to Europe in the 16th century. It's said that the tulip's velvety black center represents a lover's heart, darkened by the heat of passion. With the power to rival roses in their red variety and the sweet charm to express simple joy when yellow, it's no wonder that a tulip bouquet represents elegance and grace. Come in to a Cactus Flower location today for your $10 bunch of tulips to grace your table! 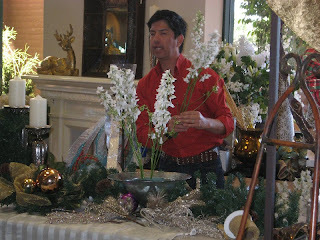 Cactus Flower makes the luxury of fresh flowers in your home more affordable every Friday from noon - close. Each Friday during Happy Hour, you can come in and select fresh cut flowers out of our cooler and enjoy 50% off! With these prices, you can afford to enjoy gorgeous flowers on your dining room table on a weekly basis. If you're not sure of what to do with fresh cut flowers when you get home, join us at a company-wide Happy Hour event on March 14 and learn design tips from a Cactus Flower designer! Each Cactus Flower store will have a designer on hand to work with you one-on-one, helping you choose colors and textures that suit your home and to then show you how to arrange your flowers like a pro. Bring your own container, or take advantage of 20% off all vases in the store. Click here for store hours and to find the location nearest you. See you on Friday, March 14! Best of CitySearch 2007 - Thank you, Phoenix! Cactus Flower has been named CitySearch's "Best Florists" for 2007, after taking home the title in 2006. Five of our Cactus Flower Locations were rated in the top ten Phoenix florists. We just wanted to give a big "thank you" to all of our customers who voted for us, and for the loyal support you've given us over the last 35 years. Thanks for making Cactus Flower Phoenix's #1 floral gift provider!